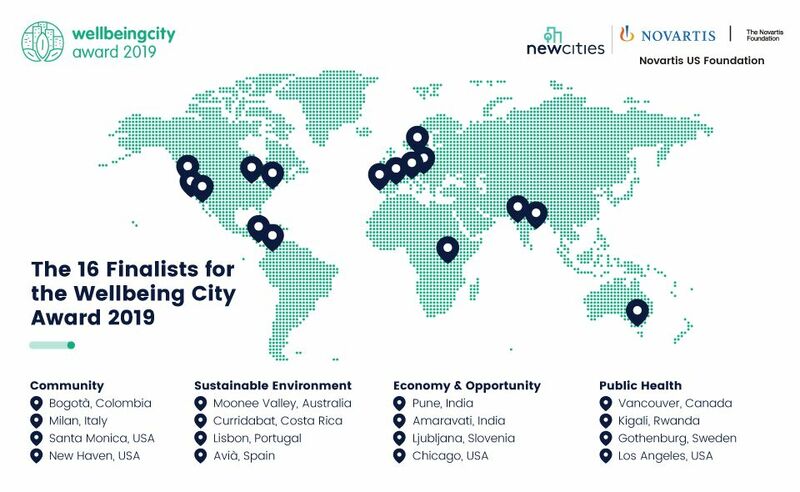 NewCities, together with partners Novartis Foundation, Novartis US Foundation, and the City of Montréal, today announced 16 finalist cities for the first edition of the Wellbeing City Award. The prestigious international Award is the first of its kind. It recognises cities placing wellbeing at the centre of urban design, planning, and policies. As part of the final phase of the Award, NewCities has brought together an esteemed Jury of Experts, including Arianna Huffington, Aisa Kirabo Kacyira, Daniel Libeskind, and Ede Jorge Ijjasz-Vasquez to judge detailed applications from finalist cities. One laureate in each of the four categories, and one overall 2019 Wellbeing City laureate will be announced April 2019. A formal ceremony and international urban wellbeing forum will be held in Montréal in mid-2019; bringing together mayors, senior government leaders, and entrepreneurs and innovators from private and non-profit sectors. John Rossant, Founder and Chairperson of NewCities says: “Too often cities are reactively addressing wellbeing as a silo issue, rather than examining ways to holistically improve the quality of life for citizens for the long term and from a social perspective. “With improving the standard of urban life as the ultimate goal, cities must be judged on activities and investments that promote wellbeing. We want to increase the mandate for and recognize cities prioritizing wellbeing. And that is why we launched this important Award” he added. The annual Award has been developed by NewCities in partnership with the Novartis Foundation, the Novartis US Foundation, and in collaboration with the City of Montréal, Toyota Mobility Foundation, Transdev, and the US Green Building Council. OpenGov Asia is a proud supporter of these awards.